Pondering more Problems. Enriching the Alice-Bob story Go to AGo to B Go to A Alice Go to B Go to A Go to B 2323 0000 1111 3232 2.5 1 Go shoot pool Alice. 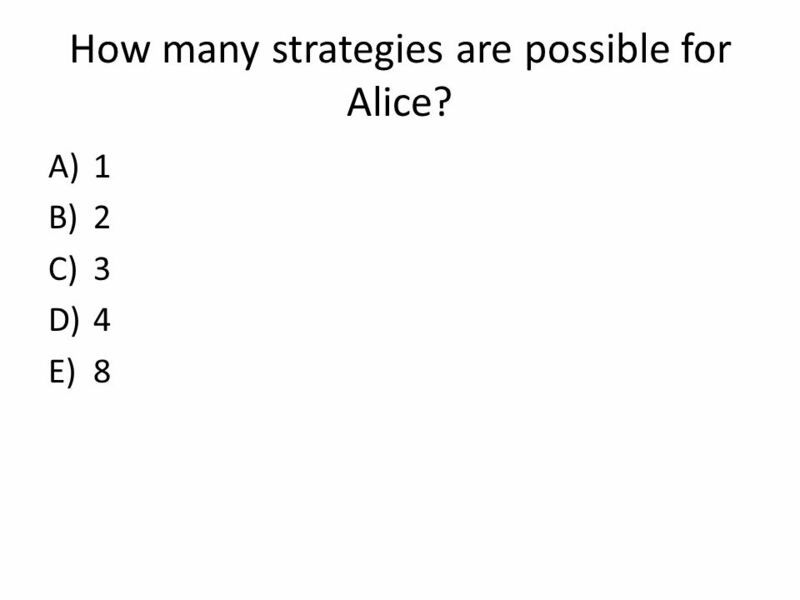 5 The strategies Alices’s strategies take the form x/y where x is the movie she chooses if she knows Bob is going to the movies and y is the movie she chooses if she knows he is shooting pool. 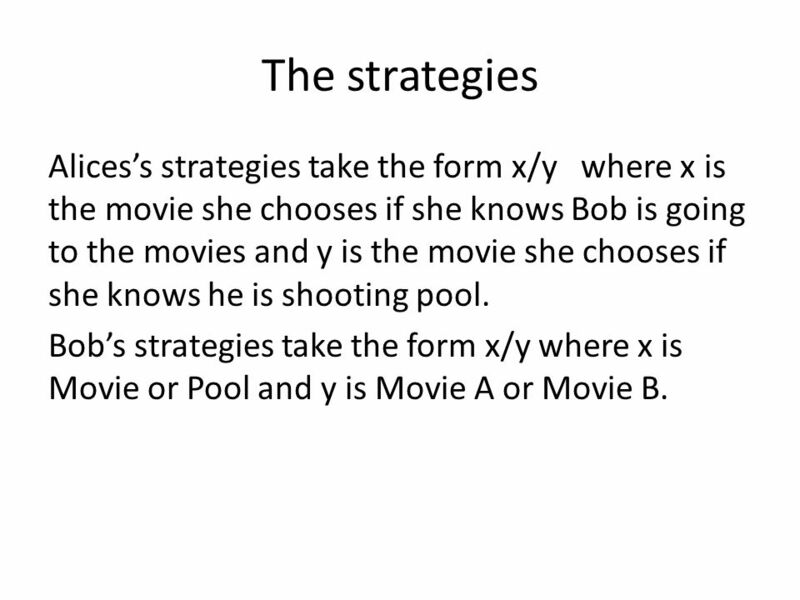 Bob’s strategies take the form x/y where x is Movie or Pool and y is Movie A or Movie B. 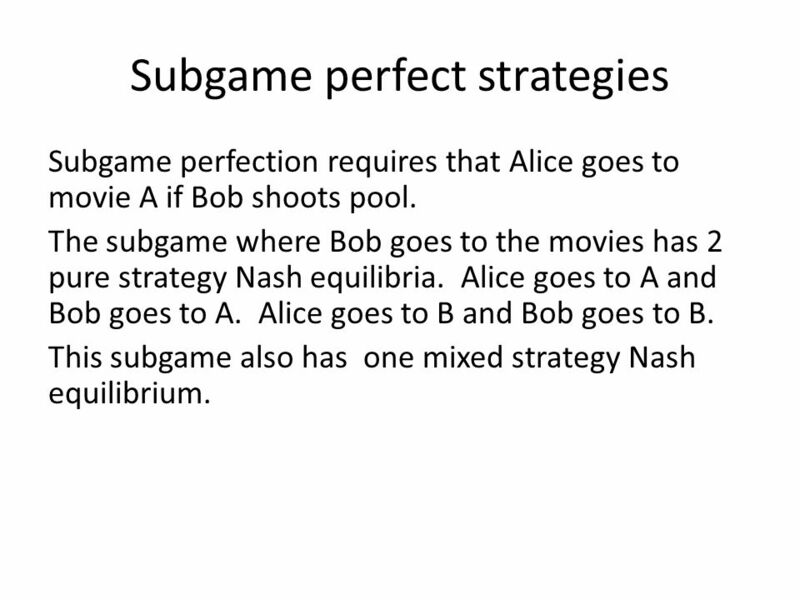 6 Subgame perfect strategies Subgame perfection requires that Alice goes to movie A if Bob shoots pool. 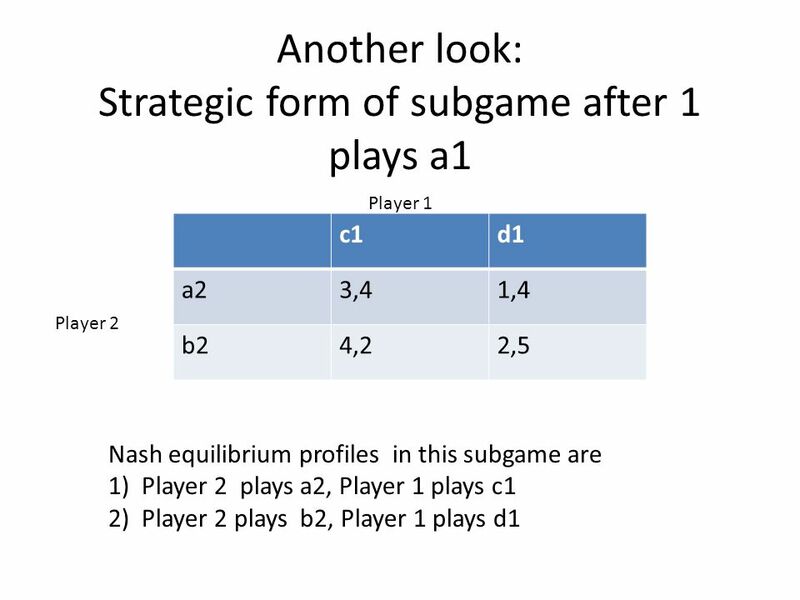 The subgame where Bob goes to the movies has 2 pure strategy Nash equilibria. Alice goes to A and Bob goes to A. Alice goes to B and Bob goes to B. 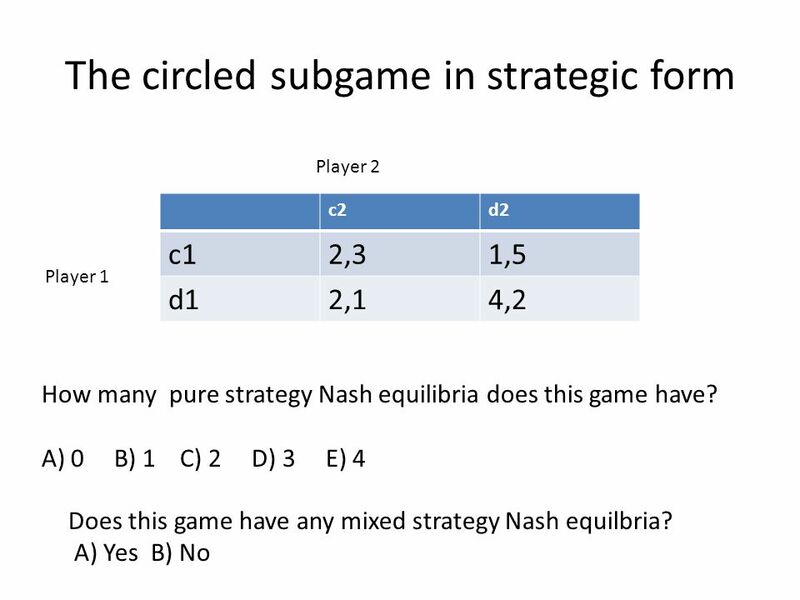 This subgame also has one mixed strategy Nash equilibrium. 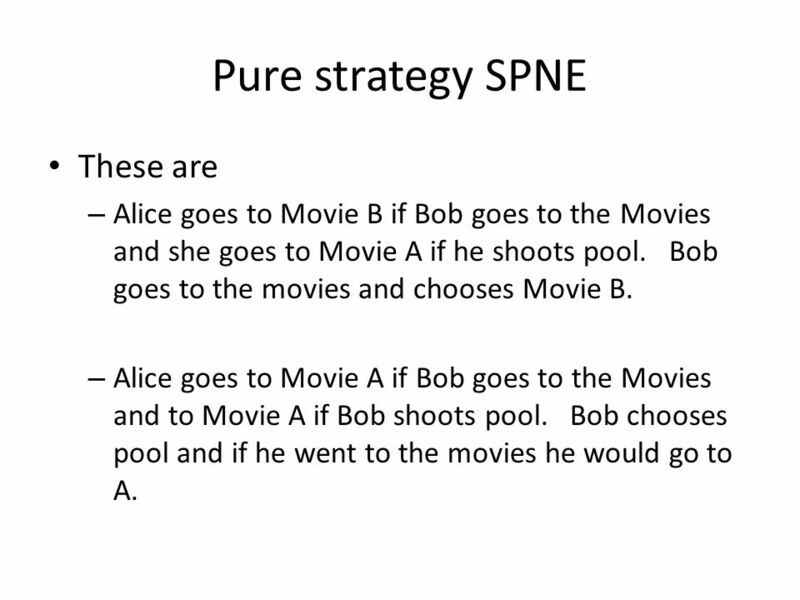 7 Pure strategy SPNE These are – Alice goes to Movie B if Bob goes to the Movies and she goes to Movie A if he shoots pool. Bob goes to the movies and chooses Movie B. – Alice goes to Movie A if Bob goes to the Movies and to Movie A if Bob shoots pool. Bob chooses pool and if he went to the movies he would go to A. 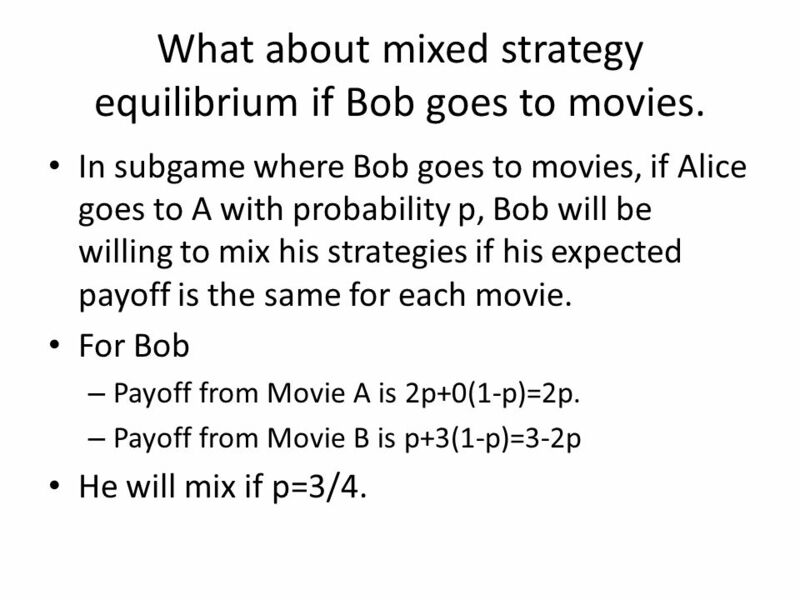 8 What about mixed strategy equilibrium if Bob goes to movies. 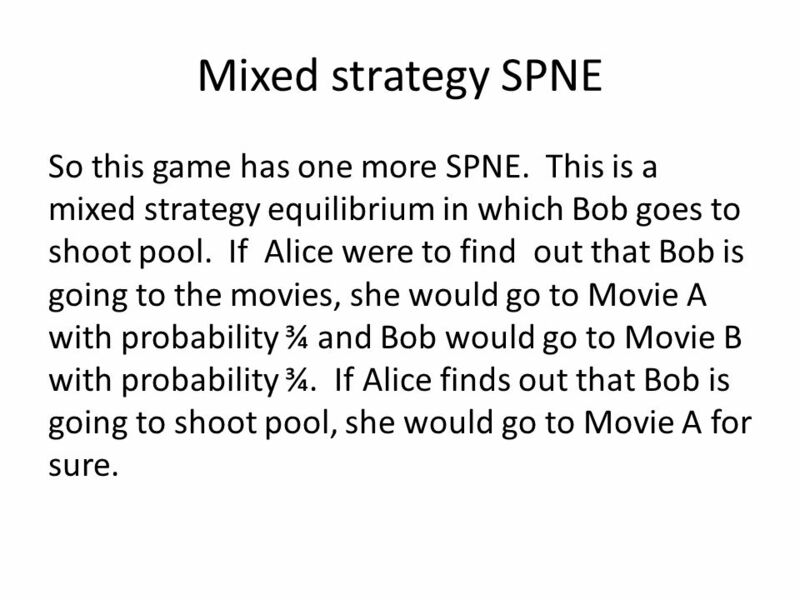 In subgame where Bob goes to movies, if Alice goes to A with probability p, Bob will be willing to mix his strategies if his expected payoff is the same for each movie. For Bob – Payoff from Movie A is 2p+0(1-p)=2p. 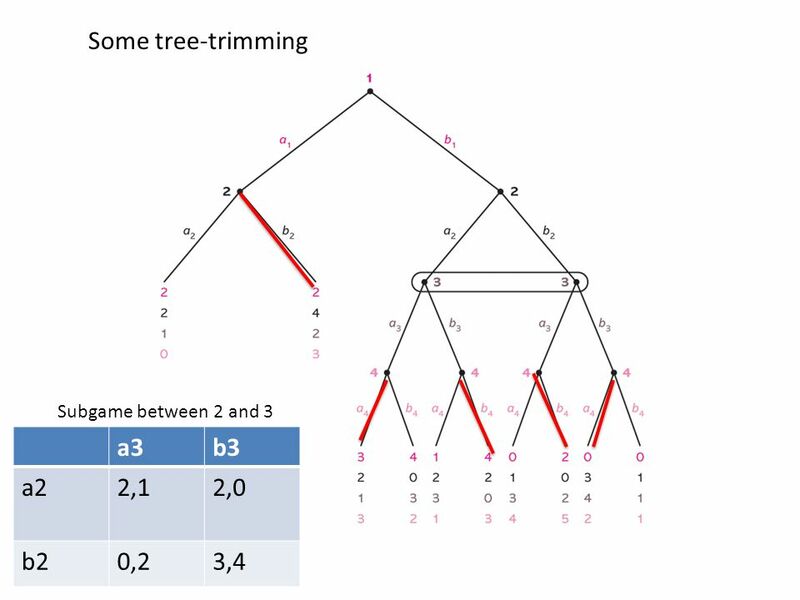 – Payoff from Movie B is p+3(1-p)=3-2p He will mix if p=3/4. 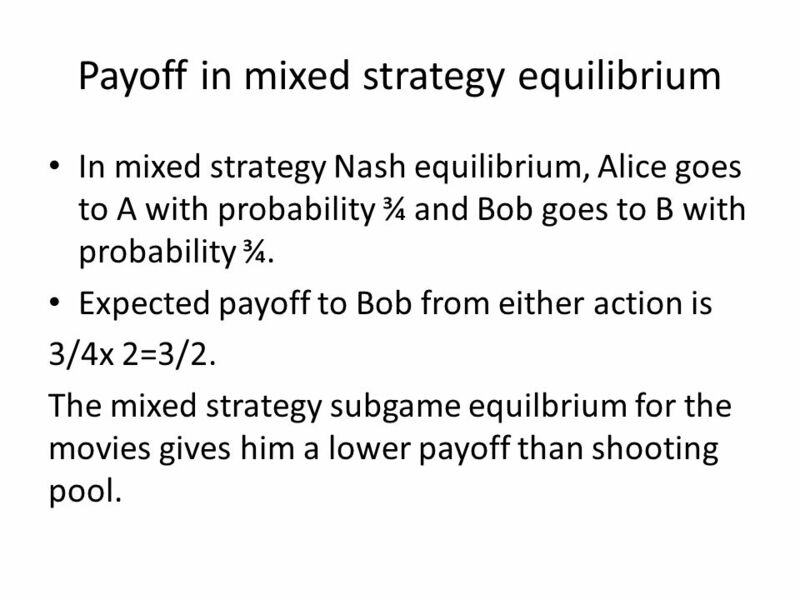 9 Payoff in mixed strategy equilibrium In mixed strategy Nash equilibrium, Alice goes to A with probability ¾ and Bob goes to B with probability ¾. 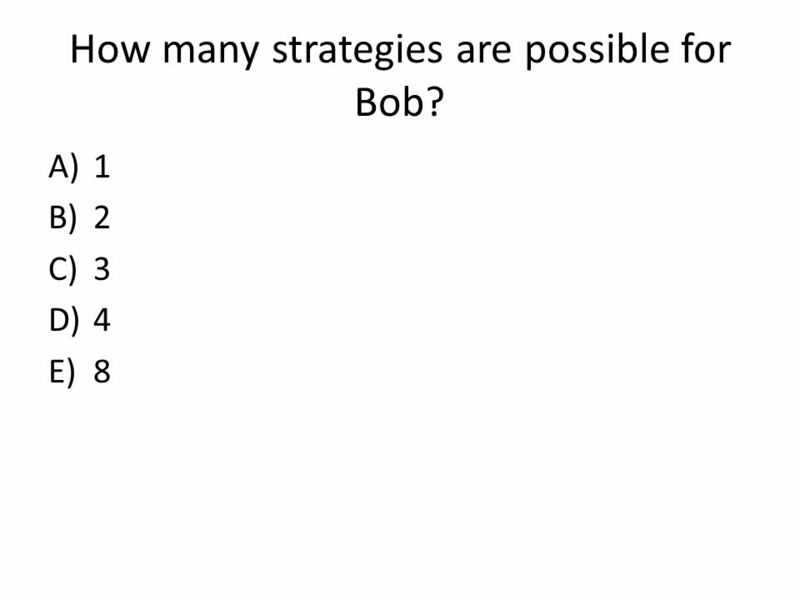 Expected payoff to Bob from either action is 3/4x 2=3/2. 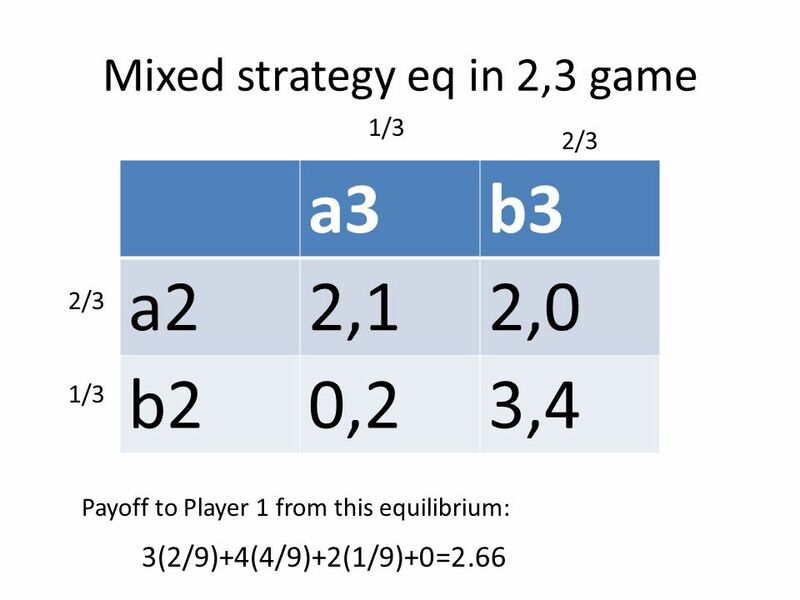 The mixed strategy subgame equilbrium for the movies gives him a lower payoff than shooting pool. 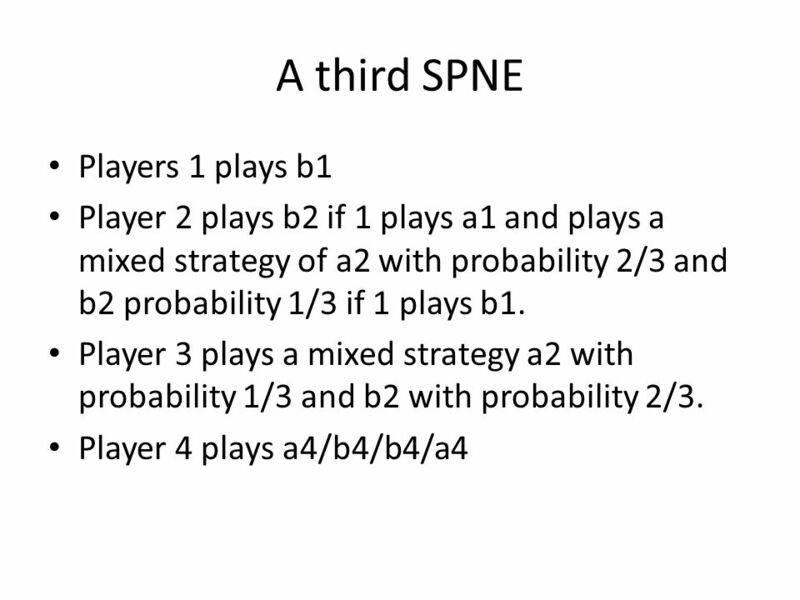 10 Mixed strategy SPNE So this game has one more SPNE. This is a mixed strategy equilibrium in which Bob goes to shoot pool. 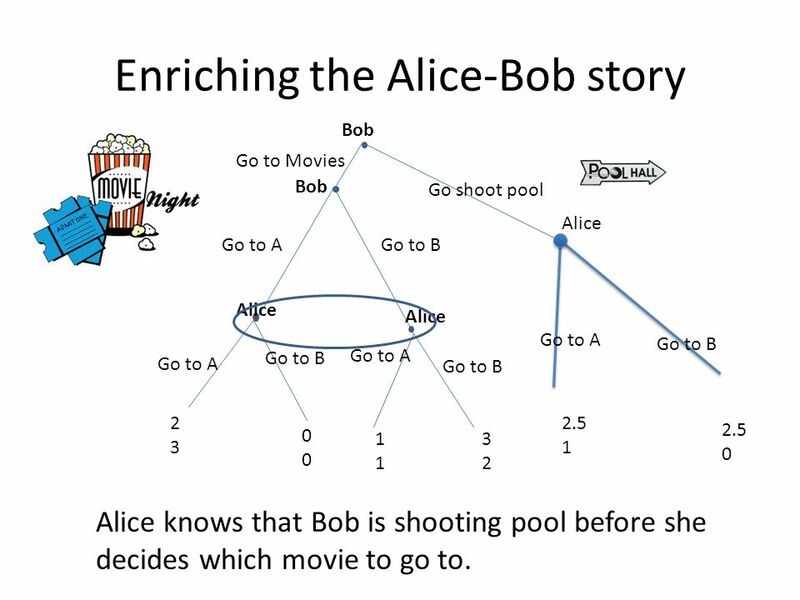 If Alice were to find out that Bob is going to the movies, she would go to Movie A with probability ¾ and Bob would go to Movie B with probability ¾. If Alice finds out that Bob is going to shoot pool, she would go to Movie A for sure. 14 What do we know so far? 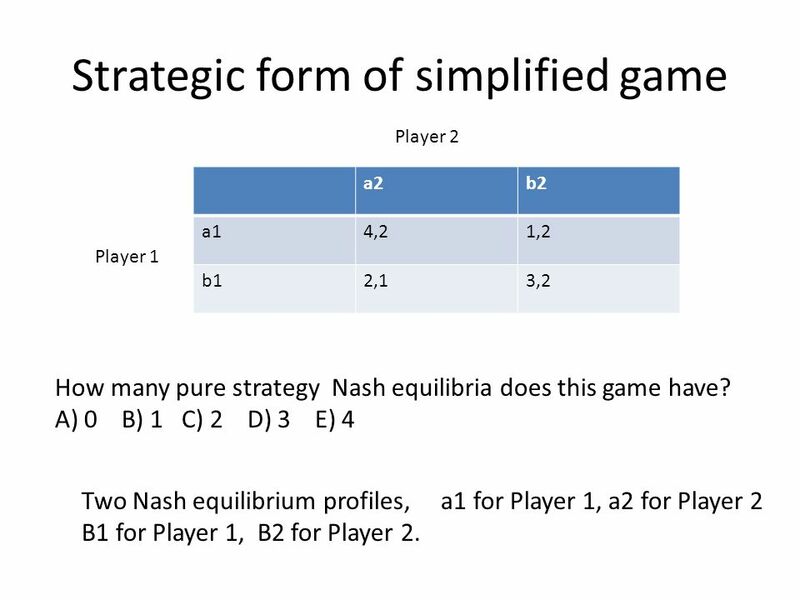 A strategy for player 1 takes the form w/x/y/z where entries specify what is done in each of player 1’s information sets (reading from top down and left to right) From what we know so far, in a SPNE Nash equilibrium, Player 1’s strategy must be of the Form ?/?/c1/d1 Let’s look into the second question mark. 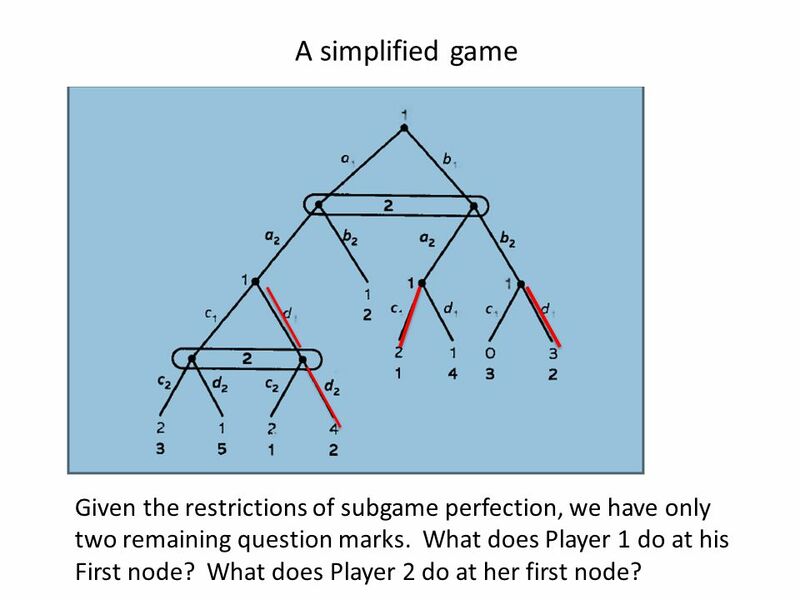 17 A simplified game Given the restrictions of subgame perfection, we have only two remaining question marks. What does Player 1 do at his First node? What does Player 2 do at her first node? 19 And now what do we know? 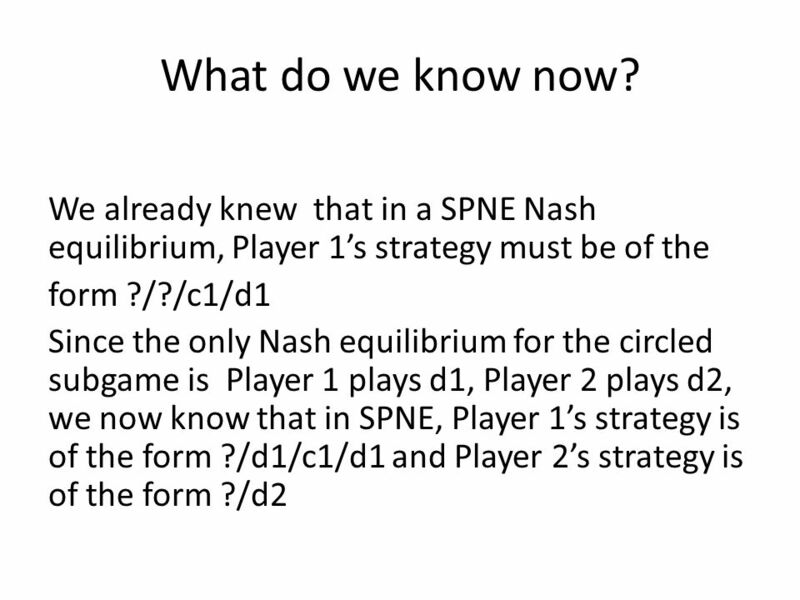 Earlier we figured out that in SPNE, Player 1’s strategy is of the form ?/d1/c1/d1 and Player 2’s strategy is of the form ?/d2 Now we see that there are two pure strategy Nash equilibria, corresponding to filling in the ?’s with the Nash equilibria that we just found. 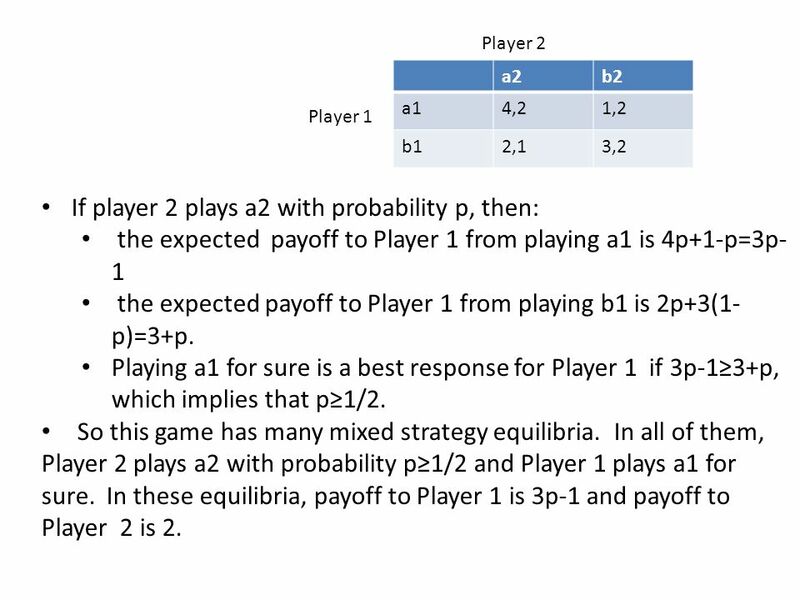 So these equilibria are Player 1’s strategy is a1/d1/c1/d1 and Player 2’s is a2/d2. 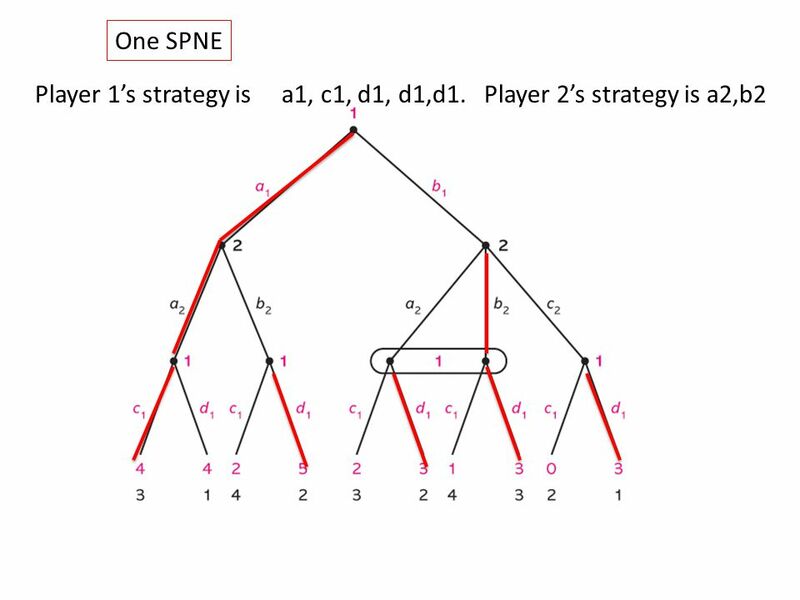 And Player 1’s strategy is b1/d1/c1/d1 and Player 2’s is b2/d2. 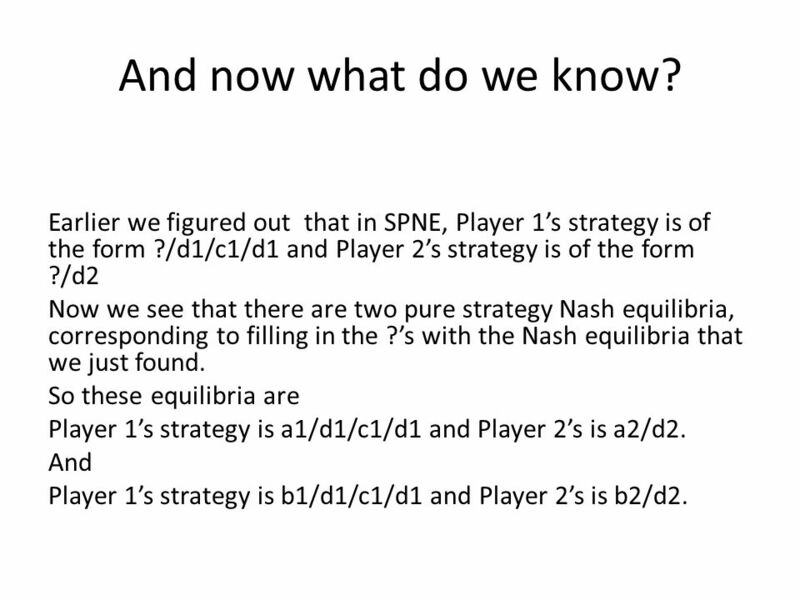 22 Finishing it up Recall that we found two pure strategy Nash equilibria, corresponding to filling in the first ?’s These equilibria were – Player 1’s strategy is a1/d1/c1/d1 and Player 2’s is a2/d2. 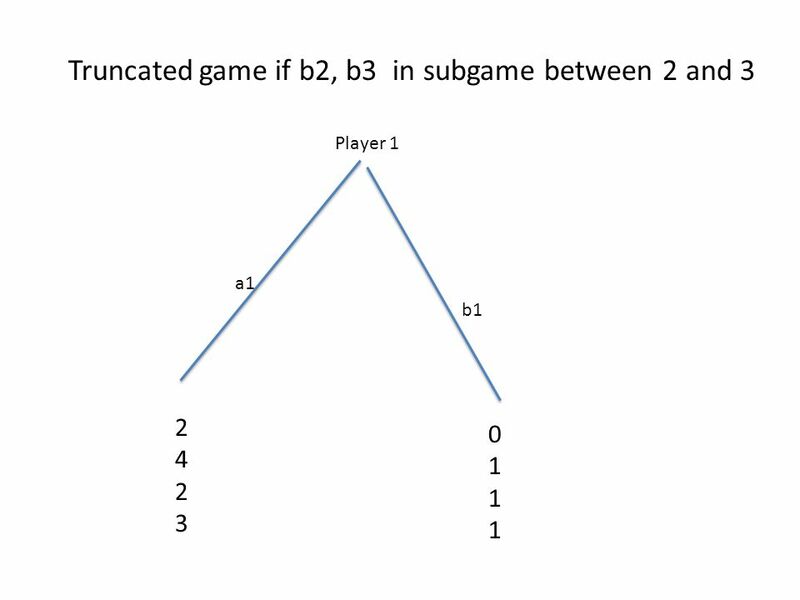 – Player 1’s strategy is b1/d1/c1/d1 and Player 2’s is b2/d2. 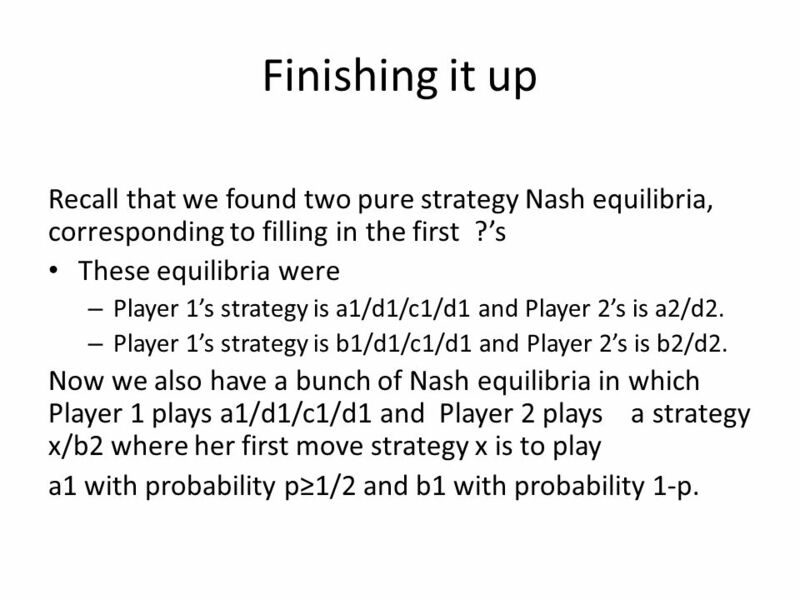 Now we also have a bunch of Nash equilibria in which Player 1 plays a1/d1/c1/d1 and Player 2 plays a strategy x/b2 where her first move strategy x is to play a1 with probability p≥1/2 and b1 with probability 1-p.
27 Handling ties In the subgame on the lower left, there are two Nash equilibrium plays for Player 1. One is c1. The other is d1. Let’s explore each possibility. 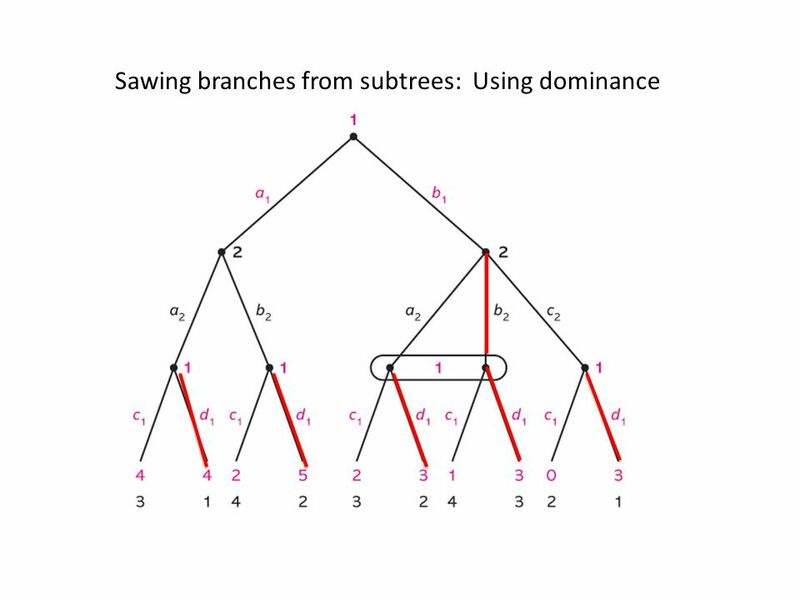 28 Suppose 1 chooses c1 at lower left node. 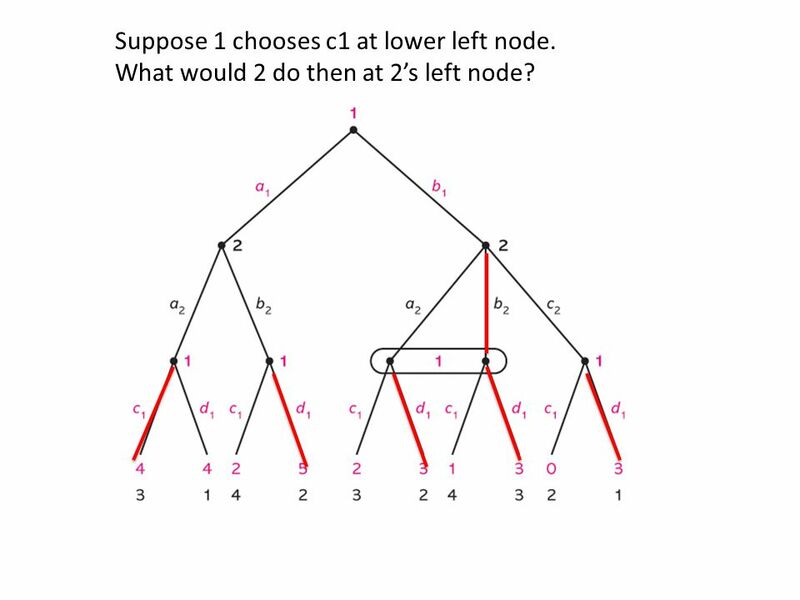 What would 2 do then at 2’s left node? 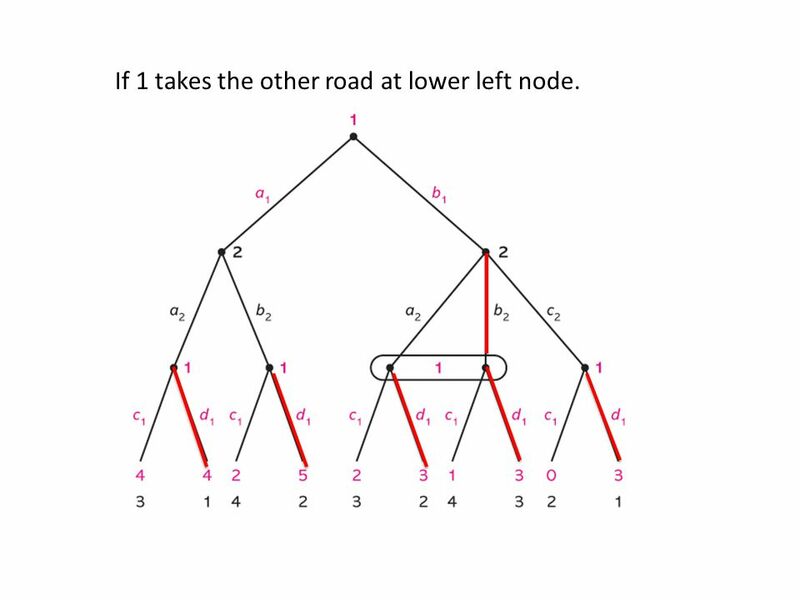 31 If 1 takes the other road at lower left node. 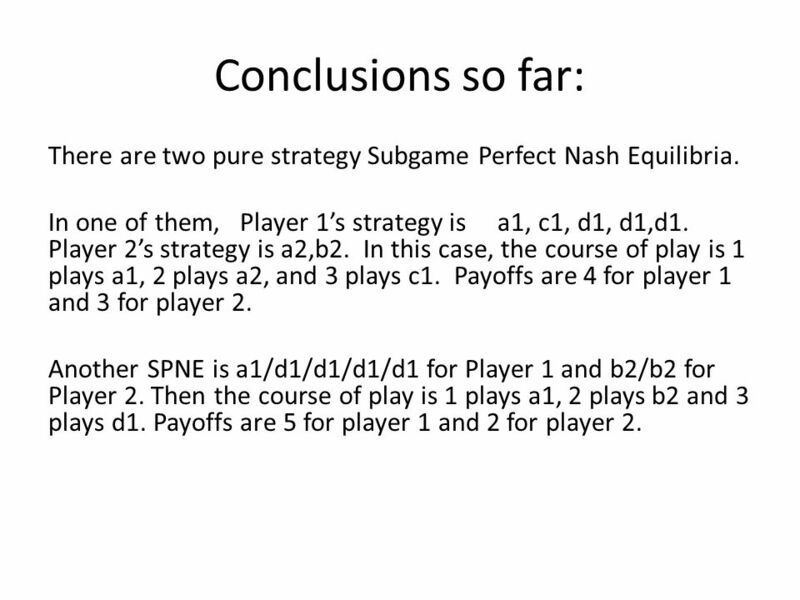 33 Conclusions so far: There are two pure strategy Subgame Perfect Nash Equilibria. 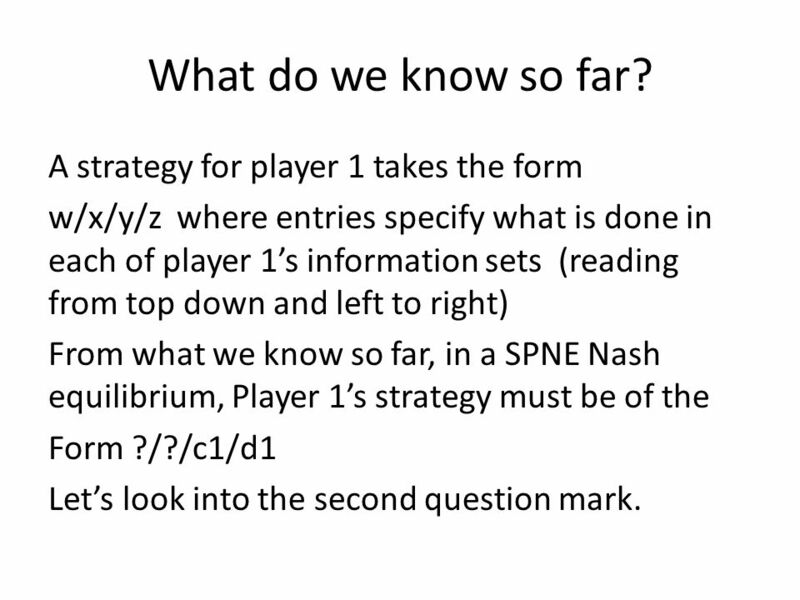 In one of them, Player 1’s strategy is a1, c1, d1, d1,d1. 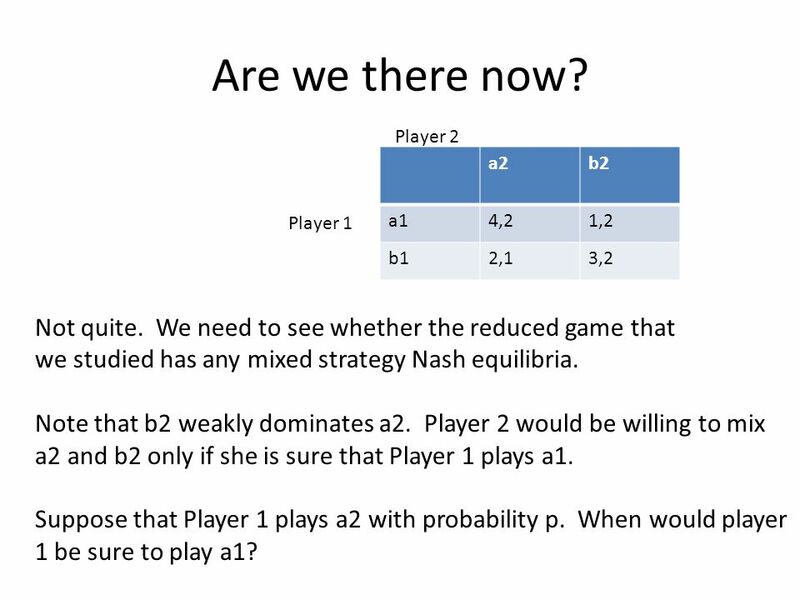 Player 2’s strategy is a2,b2. 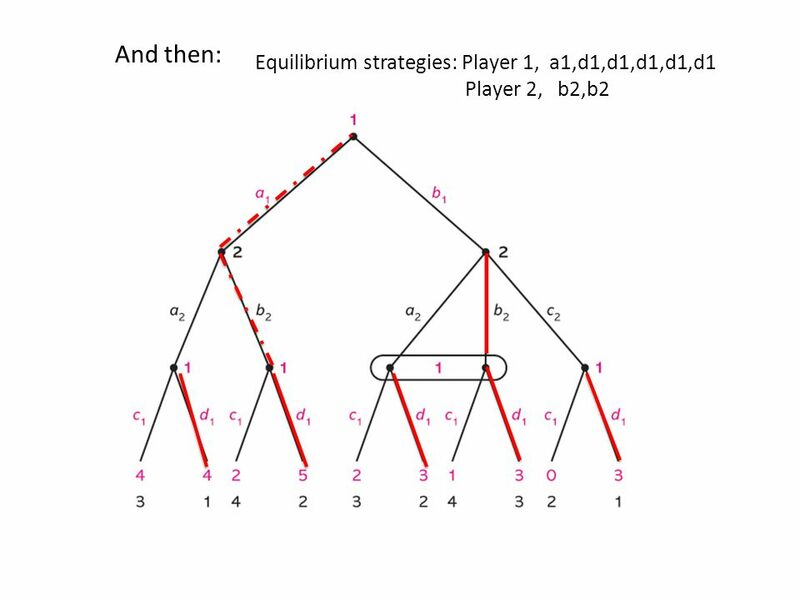 In this case, the course of play is 1 plays a1, 2 plays a2, and 3 plays c1. 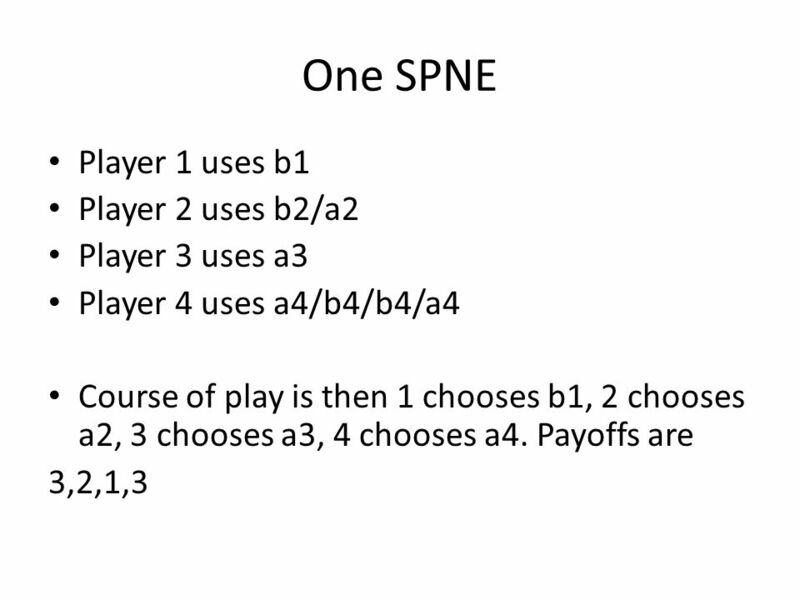 Payoffs are 4 for player 1 and 3 for player 2. 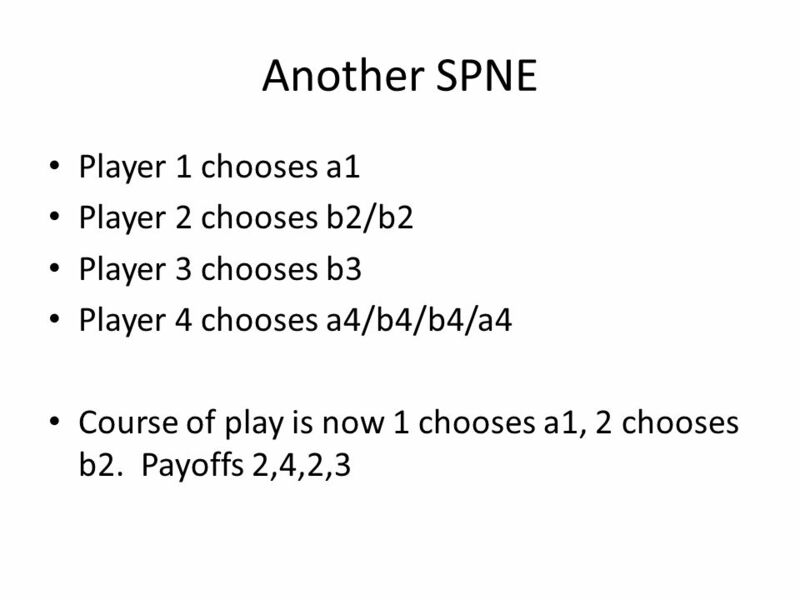 Another SPNE is a1/d1/d1/d1/d1 for Player 1 and b2/b2 for Player 2. 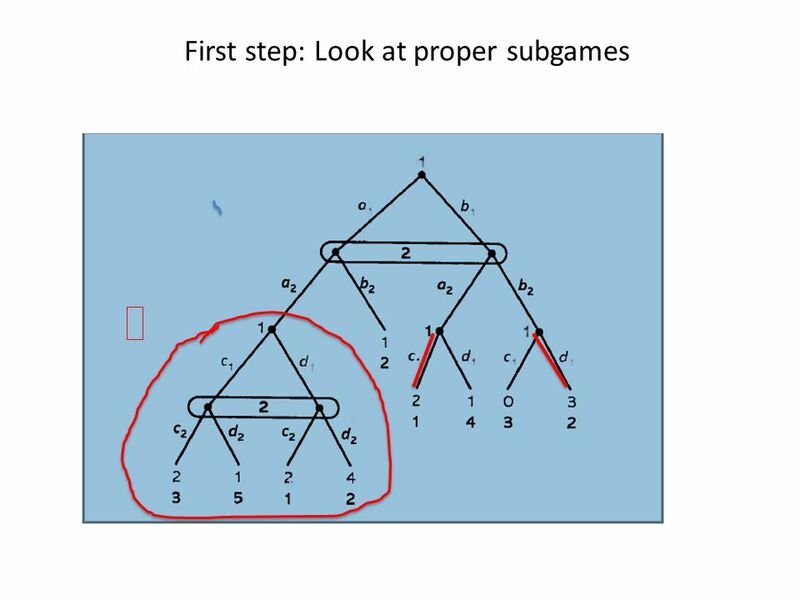 Then the course of play is 1 plays a1, 2 plays b2 and 3 plays d1. 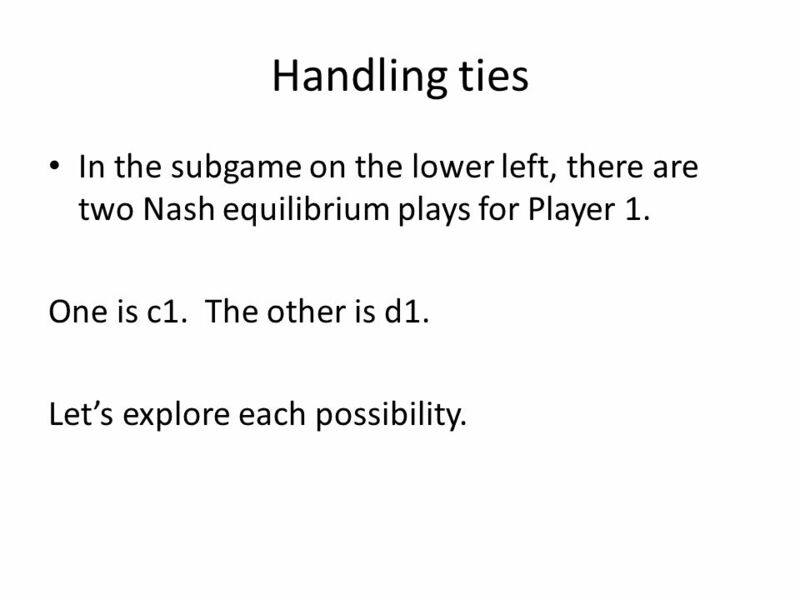 Payoffs are 5 for player 1 and 2 for player 2. 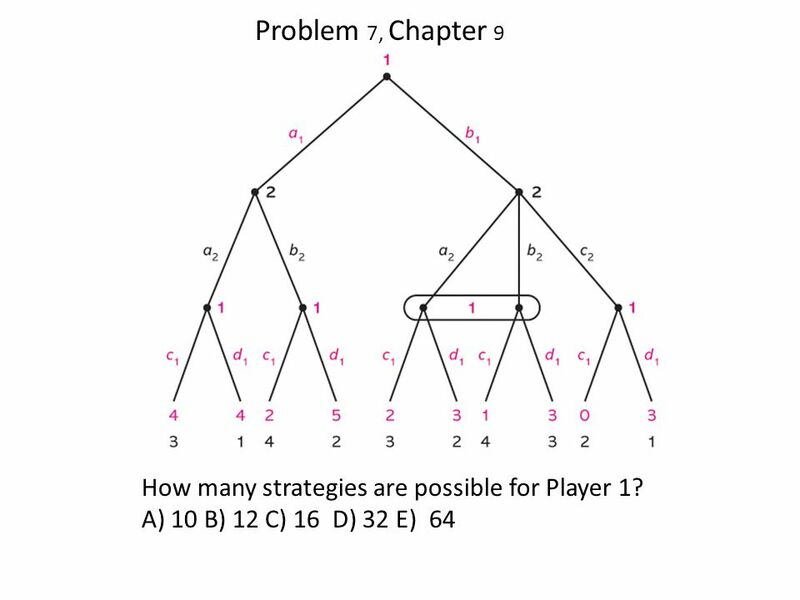 35 Also some mixed strategies At the node where 1 has gone a1 and 2 has gone Player 1 is indifferent between c1 and d1, he could also use a mixed strategy. 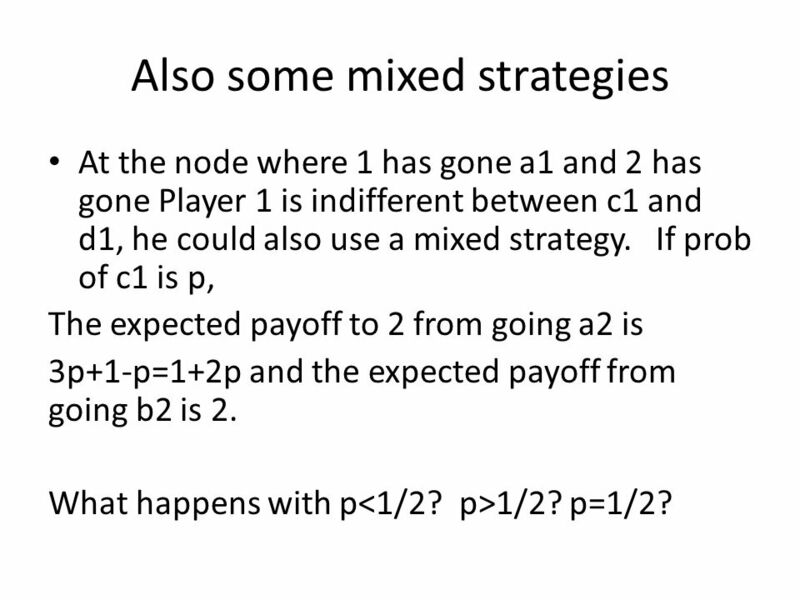 If prob of c1 is p, The expected payoff to 2 from going a2 is 3p+1-p=1+2p and the expected payoff from going b2 is 2. What happens with p 1/2? 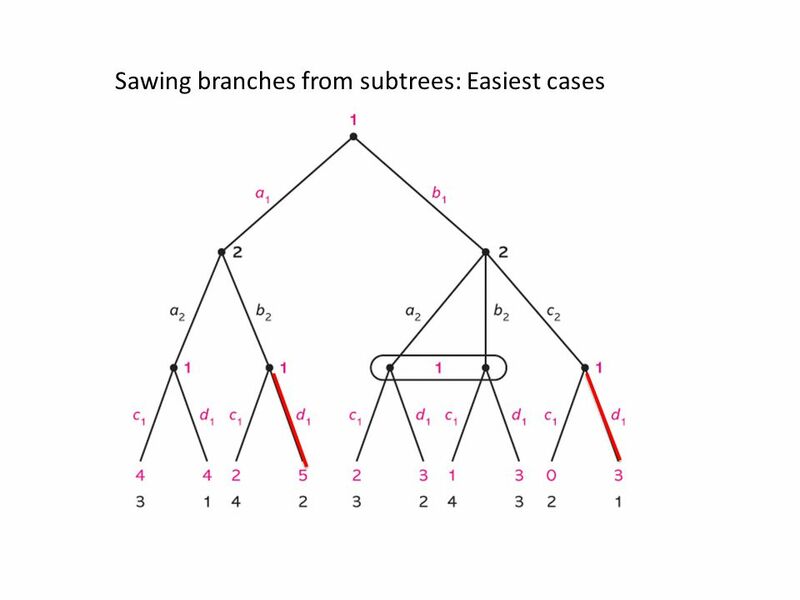 p=1/2? 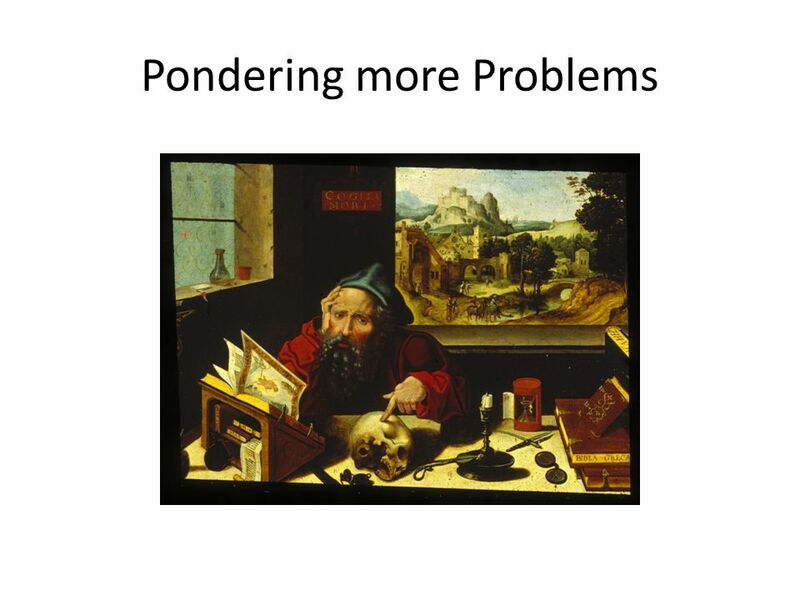 Download ppt "Pondering more Problems. Enriching the Alice-Bob story Go to AGo to B Go to A Alice Go to B Go to A Go to B 2323 0000 1111 3232 2.5 1 Go shoot pool Alice." 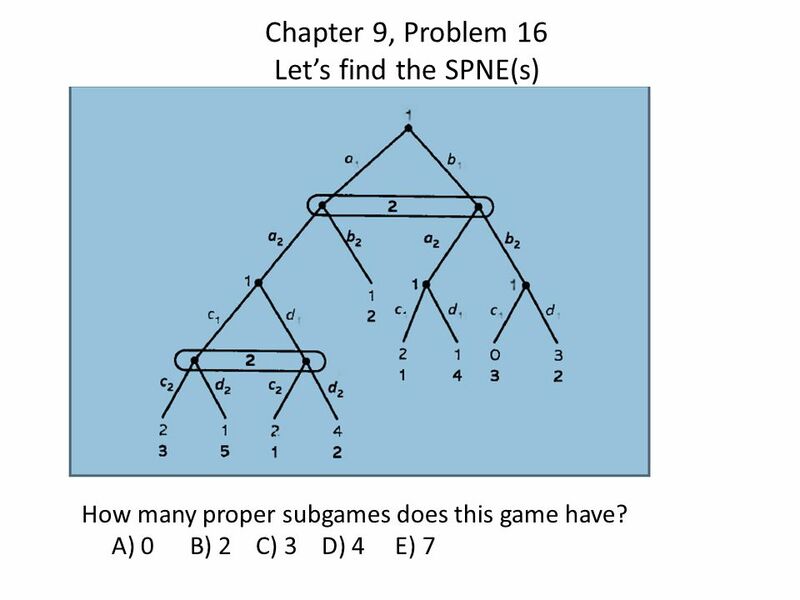 Monte Hall Problem Let’s Draw a Game Tree… Problem 6, chapter 2. 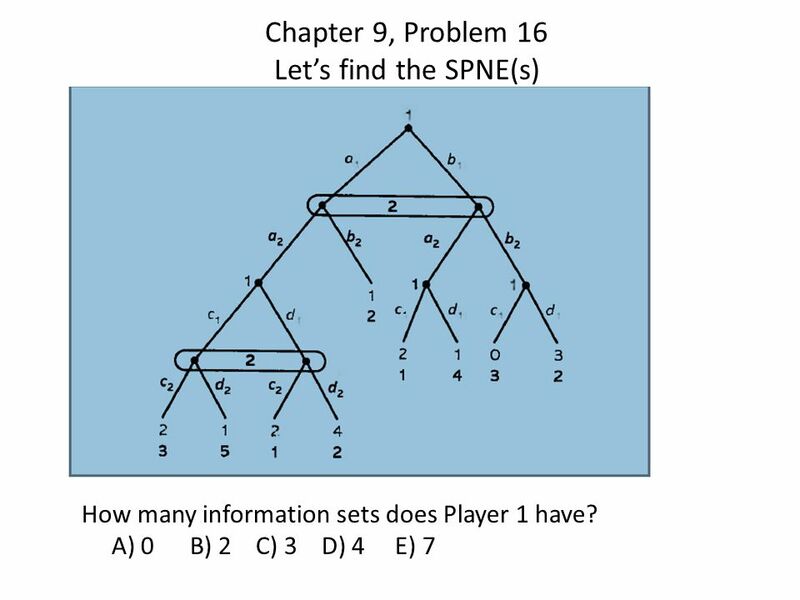 Game Theory Assignment For all of these games, P1 chooses between the columns, and P2 chooses between the rows. Clicker Question-A Chicken Game 0, 0 0, 1 1, 0 -10, -10 Swerve Hang Tough Swerve Hang Tough Player 2 Pllayer 1 Does either player have a dominant strategy? 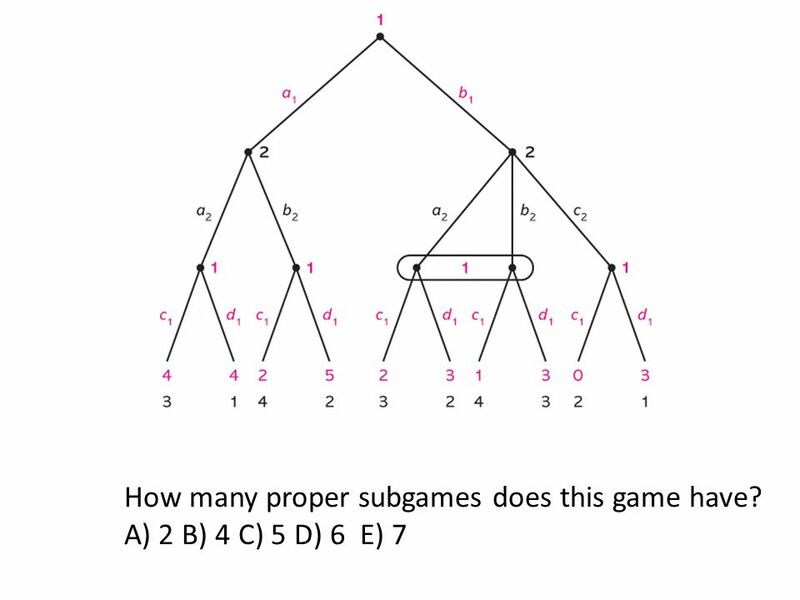 This Segment: Computational game theory Lecture 1: Game representations, solution concepts and complexity Tuomas Sandholm Computer Science Department Carnegie. Cheap Talk. When can cheap talk be believed? We have discussed costly signaling models like educational signaling. In these models, a signal of one’s. Chapter Twenty-Eight Game Theory. u Game theory models strategic behavior by agents who understand that their actions affect the actions of other agents. 1 Game Theory. 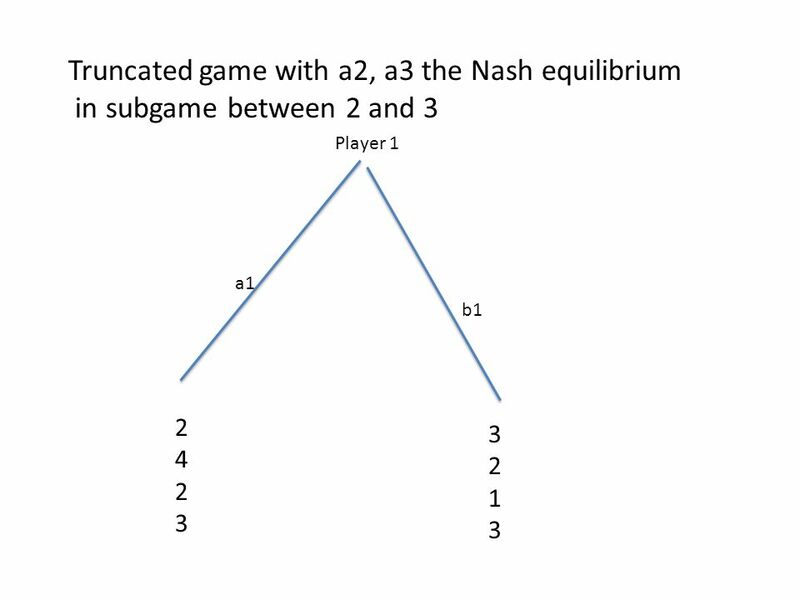 2 Agenda Game Theory Matrix Form of a Game Dominant Strategy and Dominated Strategy Nash Equilibrium Game Trees Subgame Perfection. 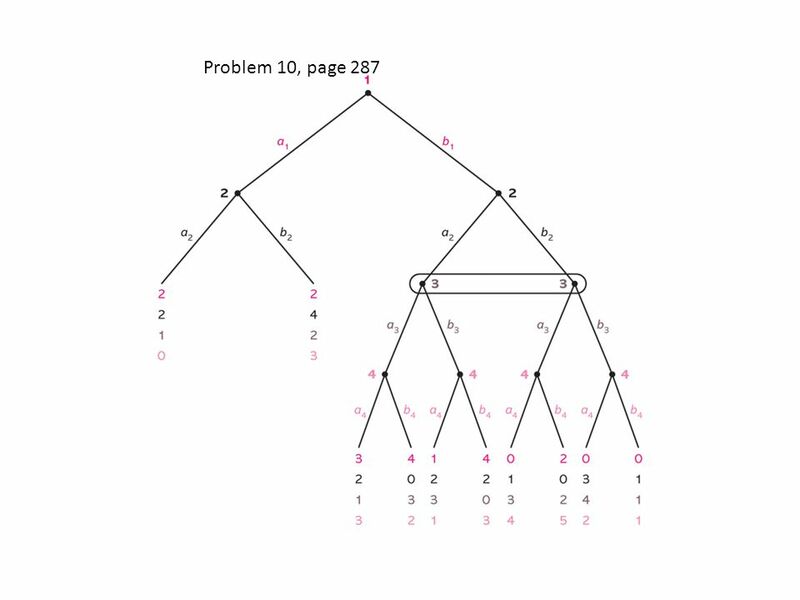 Problems from Chapter 8. Galileo and the Papal Inquisition. 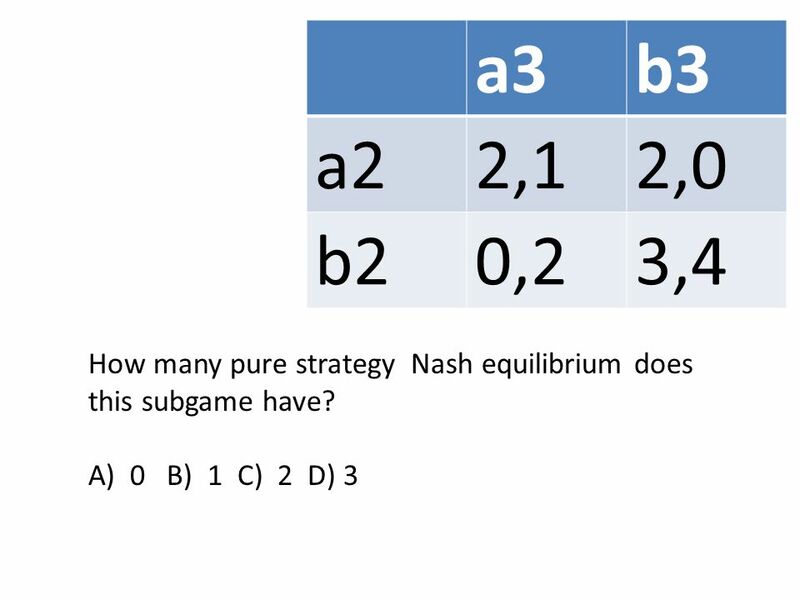 Reviewing Bayes-Nash Equilibria Two Questions from the midterm.